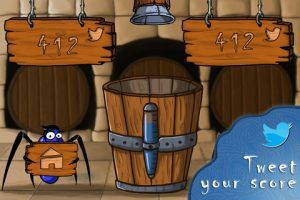 Love games based on bounce physics? 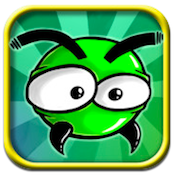 Then check outPlingi Juggle, an iPhone game developed by Boze Vukman. The game is simple to learn, but requires fast fingertips to truly master. Your goal is simple: stand beneath a tree where blue fruits fall, and bounce the fruits with your trampoline. You must bounce them multiple times in the air, keep them from hitting the ground, and shooting them into a receptacle where they turn into juice. Or maybe it’s wine. I’m not sure. Probably juice though. A plingi, in case you were wondering, is a tree spider. 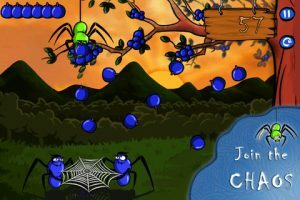 You control two spiders on the ground you hold the fruit-bouncing sheet, while a third plingi stays in the trees and shakes down the big blue fruits. The game ends when you let three berries drop, and keeping the berries in the air is way harder than you might think. It would be cool if there was an endless mode, to better appeal to frustrated gamers who can’t quite master the rhythm. Want extra lives? You can buy them via an in-app purchase, if you don’t mind spending a little cash. The physics are decent, though I wish it was possible to get variable bounces by quickly moving your bouncer across the screen. As it is, the game is fun, but more adaptable and realistic physics would really take this cute game to the next level. If you have slow reaction times or molasses-like fingers, Plingi Juggle is definitely not the iPhone game for you. However, if you like games that push your hand-eye coordination to its limits, the cute characters and fast-paced bouncing action of this fun little game may be just the thing you’ve been looking for. 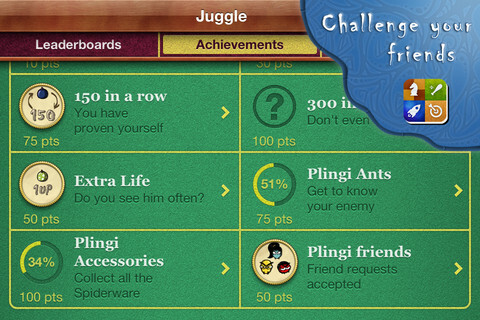 Plingi Juggle is also available on Android (Google Play link). Plingi Juggleis compatible with iPhone, iPod touch, and iPad. Requires iOS 4.0 or later.A small expedite fee was paid by the developer to speed up the publication of this iPhone game review.